Back then, here's what I said, "...The Black Sticky Gingerbread comes together like the cake that it is - straight-forward, unfussy, with a bit of kick and attitude. Melt the butter with the sweeteners, stir in a few eggs, fold in the fragrant spices and flour, spike it with some freshly grated ginger, and pour the batter into the prepared pan. 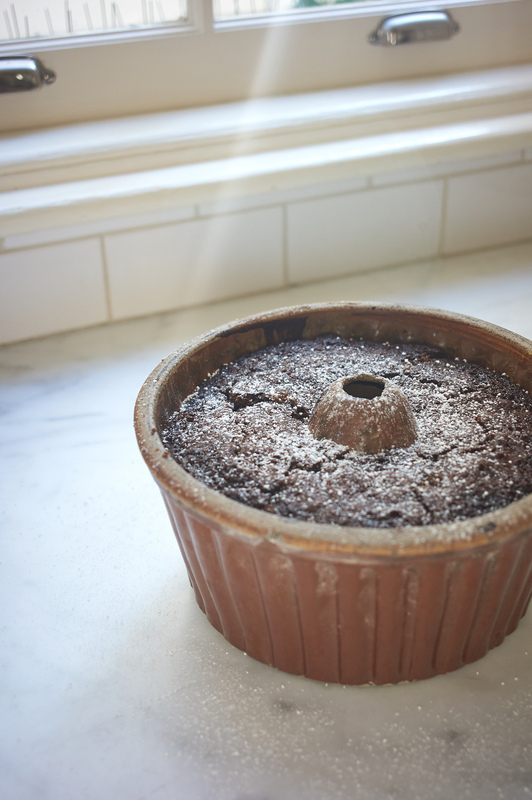 The cake is outrageously dark, dense, flavorful, and delicious. Not the prettiest cake you'll ever make, but one of the tastiest. The burnt-caramel-esque crust that forms on the top of the cake is outrageous, and that was the first part of the cake to go." ust a quick mention that I like Wholesome Sweeteners or Plantation Organic Molasses, both are unsulphered organic, blackstrap molasses. Pan choice: My version of the recipe calls for a 13x9x2 inch pan. I suspect it is a size many of you have, and it's a nice choice because you get lots of the caramelized top. That said, loaf pans also work beautifully, but don't fill them more than ~2/3 full, and line them as noted below. In this set of photos I used a 10-cup capacity Bundt pan, which means no parchment lining, and 50/50 odds for getting the gingerbread out of the pan in one piece - butter and flour well. Preheat the oven to 325F / 165C, with a rack in the center. Butter and line a 13x9x2-inch (33x23x5-cm) baking pan so the parchment hangs over by a couple inches. This will help you remove the cake from the pan later on. Pour the batter into the prepared pan and bake for ~45-60 minutes. Start checking for doneness after about 45 minutes. When the top of the cake springs back when touched you're good. For me this is usually ~55 minutes, but the baking time will depend on your oven and the shape of your pan. Allow the cake to cool for 10 minutes, then, using the overhang of parchment (if you're using a rectangular pan), lift the cake out of the pan and cool completely on a wire rack before cutting. If refrigerated, the texture becomes dense and sticky - in a good way, just let it come up to room temperature before serving. And, as I'm sure you can imagine, this cake is particularly nice served with boozy whipped cream. Adapted, quite a bit over the years, from Regan Daley's In the Sweet Kitchen.